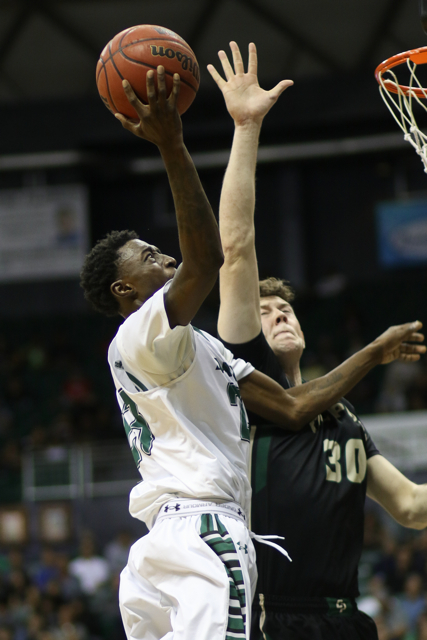 A lot sure has changed for the University of Hawai’i basketball team in the last month. On the night of January 7, the Warriors suffered their worst loss of this season in an 84-56 defeat at UC Irvine. 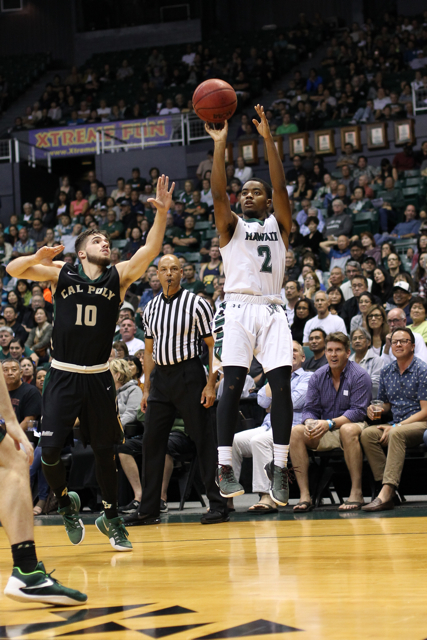 It was the first week of Big West Conference action, and Hawai’i started 0-2. This Saturday, the Warriors get another shot at the Anteaters. 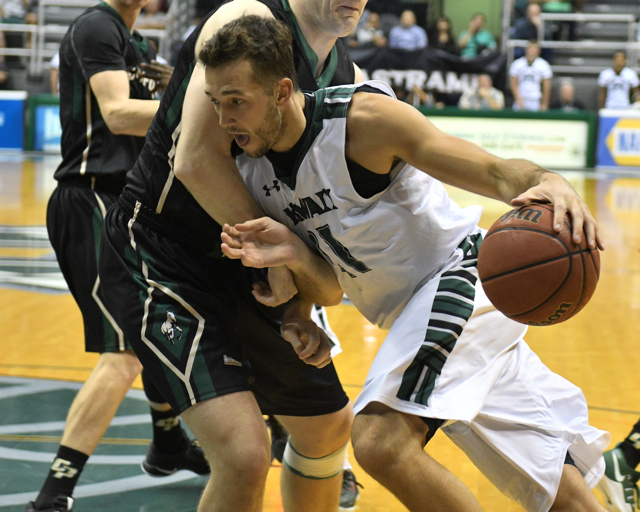 Hawai’i is now 12-11 overall and in a tie for third place in the Big West at 6-4. UCI is 14-12 overall and in second place at 7-3. The game is scheduled to start at 7:30 p.m. at the Stan Sheriff Center, and is part of a basketball doubleheader with the UH women’s team. The UH women will play UC Santa Barbara at 5:00 p.m. Fans with tickets to the men’s game can arrive early to watch the women’s game. The doubleheader is being promoted as a “Black Out” and fans are encouraged to wear black shirts. The Warriors are on a four-game winning streak, with the latest coming in the form of a 74-65 home win over Cal Poly on Thursday. UCI snapped a three-game losing streak this week with a 64-47 home win over UC Santa Barbara on Wednesday. 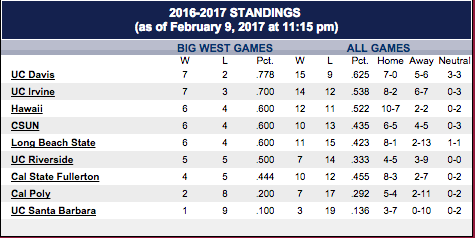 Hawai’i is the hottest team in the Big West, led by the hottest player in the Big West in Noah Allen. The 6-foot-7 senior forward is averaging 23.1 points and 7.1 rebounds per game over the last eight games. The Warriors are 6-2 in those games. Interestingly enough, Allen’s hot streak started immediately following a zero-point performance in the loss at UC Irvine. Overall, Allen is averaging team-highs of 14.8 points and 5.7 rebounds per game. He also leads the team with 25 steals, and is second with 30 3-pointers. Junior forward/center Gibson Johnson is averaging 10.5 points and 4.4 rebounds per game, and will likely have to match up against UCI’s 7-2 center Ioannis Dimakopoulos. Sophomore forward Jack Purchase is averaging 10.1 points and 4.1 rebounds per game, and ranks second in the Big West with 56 3-pointers. The sophomore backcourt duo of Sheriff Drammeh and Brocke Stepteau are averaging 9.3 and 7.4 points per game, respectively. Stepteau leads the team in assists with 3.3 per game, and Drammeh is second at 2.5. Hawai’i’s “bigs” – Johnson, Purchase, and freshmen reserves Ido Flaisher and Zigmars Raimo – came up big in Thursday’s win over Cal Poly, and they’ll have to do it again on Saturday. The Anteaters are the biggest team in the conference, and they lead the league in rebounding (39.8), rebounding margin (+7.4) and blocked shots (4.3). They are also considered the best statistical defensive team in the Big West, ranking first in points allowed (65.9) and opponent field goal percentage (.385). While the 6-10 Flaisher is Hawai’i’s tallest player, the Anteaters can counter with 7-2 Dimakopoulos (11.5 points, 4.3 rebounds per game), 6-10 Jonathan Galloway (4.6 points, 7.3 rebounds per game), 6-8 Tommy Rutherford (6.6 points, 5.2 rebounds), and 6-10, 320-pound Brad Greene (3.1 points, 3.3 rebounds). UCI’s leadership remains with its backcourt. Luke Nelson, a 6-3 senior, was a first-team All-Big West Conference selection last season, but has been limited to eight games this season. He is expected to be in the starting lineup against Hawai’i, and is averaging 13.3 points, 2.8 rebounds and 2.6 assists per game. Jaron Martin, a 5-10 senior, is averaging a team-best 13.4 points and 3.3 assists per game, and leads the team with 50 3-pointers. Hawai’i starting guard Leland Green missed the last two games due to illness and his status will likely be a game-time decision. Tickets: Lower level – $30 for all seats; Upper level – $18-$20 for adults; $16 to $18 for senior citizens; $5-$7 for students (ages 4-high school). UH-Manoa students free with valid ID. Parking is $6. Theme: “Black Out” – fans are encouraged to wear black UH apparel. Doubleheader: The UH women’s team will play UC Santa Barbara at 5:00 p.m. Fans with tickets to the men’s game can arrive early and stay for both games. It doesn’t rain inside the SSC. NIce nite to come out in force and support our Warriors! Only two more home games ! If we stay out of foul trouble. The last time they played I was impressed with Irvine’s reserves so I did a quick check on their freshmen.They had quite a recruiting class; all-CIF; all-league, double-double averages, McDonald’s AA, etc. Their depth concerns me, but Ganot has been able to go deep into his rotation and, as he often says, someone unexpectedly always seems to step up (like Ido on Thursday). Hoping for a competitive game. Nice night for BB. Matlin where are the students our Manoa Maniacs?? Lots of empty seats in our student section ok on a Saturday night. Once again pore marketing to the students no promotions. Getting smoked. 53-36 11 min left. No one on the team can guard Nelson Leland needed out there tonight. He wasn’t dressed tonight. We reallly need a scorer for next year No doubt.